The Departments of Paediatrics and Psychiatry (generously supported by the Creswick Foundation) recently hosted two public lectures by Professor Robert Emde, Emeritus Professor of Psychiatry, University of Colorado. 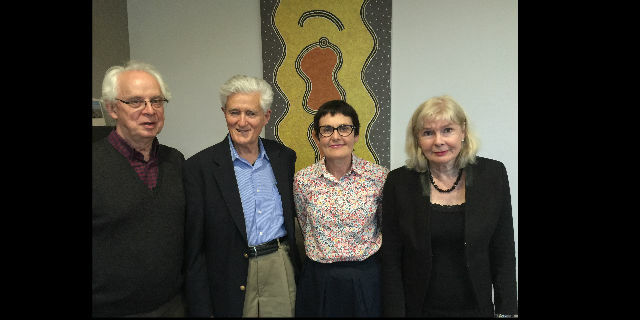 Left to right in the photograph are Associate Professor Campbell Paul (Psychiatry), Professor Robert Emde, Professor Brigid Jordan (Paediatrics), and Associate Professor Frances Thomson-Salo (Psychiatry). Robert N. Emde, M.D., retired from his position as Professor of Psychiatry, after a University of Colorado Medical School career of more than 40 years. His career involved research on early socio- emotional development and the evaluation of early childhood intervention programs. He also chaired the international task group that revised the diagnostic classification system for mental problems of children under age four (DC: 0-3R, Zero to Three Press, 2005). Professor Emde was also a member of the National Academy of Sciences task force that produced the policy-oriented book, From Neurons to Neighborhoods. He is currently participating in early childhood research as part of the Colorado-based American Indian and Alaska Native Mental Health Center. The importance of pioneers: Personal reflections on Rene Spits and Selma Fraiberg: Infant Mental Health and using your emotions (held on 17 March). This talk included personal anecdotes and reflections moving towards relationship-based approaches for diagnosis and prevention. Infancy and our Endowments in Development (held on 21 March) described ‘gifts’ for positive socio-emotional adaptation provided by our evolutionary biology, that are present in infancy and continue throughout life, as aspects of the developmental process. The lecture considered how our models of understanding development have changed, and, in recent times, how we have become aware that core continuing moral functions (of reciprocity, empathy and valuation), are present in infancy. Although early-appearing, these are dependent on nourishing contexts of care-giving, and regulation. Because of challenges of conflict and circumstance, these endowments also carry with them implicit obligations for us in helping and health.